Last year, St. Francis of Assisi Catholic School embarked on a strategic planning venture. This process allowed the pastor, principal, teachers, parents, Advisory Council, and parishioners to collaboratively examine the school as a whole, and to more thoroughly understand our organization’s Mission, as well as to establish a workable Vision for the school’s future. Goals were set and steps implemented to actively achieve these goals; with a focus on closing the gap between where we are and where we strive to be, based on that Vision statement. This strategic plan is designed to be a working document that will help to guide us through the year 2022, all while strengthening our student population, and resources while continuing a strong tradition of excellent Catholic education. I wish to express my gratitude to the hardworking committee, who worked tirelessly throughout this process for the benefit of our school. It is my hope that all of our stakeholders will continue to believe in and support our Mission, and that it helps everyone to understand what is necessary to make our parish school successful. I hope that this annual report, designed around our strategic plan, is educational, encouraging and inspirational. St. Francis of Assisi Catholic School inspires academic scholars motivated to serve and lead the world with Faith and moral character. This vision statement provides guidance and inspiration for the future of our school. It is an understatement to say that St. Francis School already exhibits many of these characteristics, but, as with any organization, there is always room for improvement. As a whole, we can collaboratively strive to embrace these ideals with greater consistency, and creativity. Strengthen our comprehensive STREAM educational platform for preschool through 8th grade. Establish an 8th-grade science curriculum, adopt Journeys reading curriculum K-8 and review K-8th math curriculum. Implement a comprehensive Marketing Plan. Increase enrollment by 10% yearly. Retain 100% of students eligible and desired. Increase donations to the school by 10% each year. Increase the level of funding for the Foundation by 3% of the principal. Subside utilization of the Foundation for operational funding. Investigate fundraising options and opportunities. To enhance the relationship between the school and the parish. Invite parishioners to all school events and encourage school families to attend church events. 96% of students at St. Francis School met grade level benchmark standards in the STAR math assessment. 82% of students at St. Francis School met grade level benchmark standards in the STAR reading assessment. 3rd-grade student: JT Reeves, American Legion Essay selected as a unit winner and submitted to the American Legion Auxiliary Dept. of Oregon. 7th grade Oregon Battle of the Books team competed in the final four at Districts. Middle School Lego Robotic team took third place at the District competition. 27 winning entries in the Bend Research Inventerprise Contest. 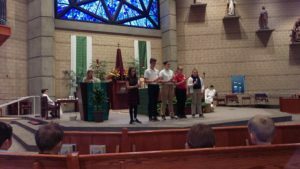 13 students received First Holy Communion and 4 students received Confirmation. 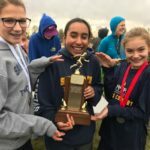 7th-grade girls place first in the Central Oregon Small School District Cross Country and Track meets. Funding for SFS depends primarily on tuition revenue- although tuition only covered 49.4 % of the full cost of education. Over the past 3 years, annual tuition has increased by 4%. Parish subsidy represents 4.3% of all school revenue, totaling $46k. Investment from our Parish is used to subsidize tuition and offer financial assistance to families in need. Close to 1/3 students apply for financial assistance each year, with the rate of families needing assistance each year increasing by 37%. This represents a total of $91,439.10 in assistance given and 30% of our enrollment. Currently, all teachers’ salaries are at 80% of the local district salary schedule. With salaries starting at $30,264 and ending at $61,012. Move the school funding model from an institutional benefit model to a child benefit model. A child benefit model would allow us to allocate funds into tuition assistance based on financial need. This model strives to give every child a Catholic education. It has the advantage of increasing revenue because more parents contribute tuition dollars based on what they can afford. It also has the advantage of increasing enrollment, which makes the school more attractive and viable. Fund tuition assistance generously and administer in a way that achieves enrollment goals and furthers the mission of the school. All Diocese Parishes with schools will provide 20% of parish offertory income as an investment in their Catholic School and this ministry. "St. Francis fosters a lifetime of learning with an expectation of excellence." Welcome, the faculty and staff at St. Francis of Assisi Catholic School are honored to be a part of the investment in the lives of your children. As we prepare for the rapid approach the first day of school, Tuesday, September 4th, we have resumed our regular school office hours of 7:30 am to 3:30 pm Monday through Friday. 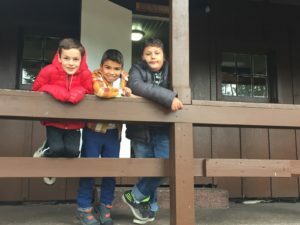 Teaching staff will be training at the Powell Butte Retreat Center August 23rd & 24th and will return to school, Monday, August 27th for in-service/work days prior to the opening of school. Thursday, August 30th from 1-3 pm, please join us for our ice cream social! This is a great opportunity for your children to see their teachers, catch up with friends, and feel comfortable with their classroom setting. Middle School students will be registering for their electives at the Ice Cream Social. In addition, all families are encouraged to attend Back to School Night on September 6th. Orientation for new families will begin promptly at 5:45. At that time, we will be explaining some things such as the student drop off/pick up line, Darkness to Light, fundraising, etc. If you are a returning family, please join us at 6 pm as this is when we will have a brief staff welcome before parents are released to learn about general information and what expectations for the year are in your child(ren)’s classroom. Beginning Monday, Aug. 27th, parents and students are invited to attend the 7 am Daily Mass as it will be held in the St. Clare Chapel; only Middle School students may be unaccompanied by an adult. Parents are welcome to join Adoration as it will follow Mass until noon. To enter the handicap doors to the Narthex will be unlocked for Mass and adoration. The convent house blessing will be after the 5 pm Mass on Sept. 1st, followed by a parish barbecue which all families are invited to attend! Now is a good time to help your child(ren) prepare for returning to school by helping them to wake up and go to bed a bit earlier each day. Starting and ending times for pre-school through 8th grade are 8:00 a.m.-3:00 p.m. All students should arrive 5 minutes before school starts in order to be prepared for the beginning of the day. However, students should not arrive before 7:45 as there is not adult supervision unless prearranged with the office for Before School Care. Remember, if your child is tardy, it is very disruptive to the early morning routines of other students/classrooms. Thank you for your help. Please feel free to call or stop by the office if you have any questions. We appreciate your love, support and encouragement, and are looking forward to a very Blessed school year. See you soon! "St. Francis of Assisi Catholic School inspires academic scholars motivated to serve and lead the world with Faith and moral character." The Christmas Season is a perfect time to reflect on our blessings. We are blessed to have such a caring, passionate community of students, families, and staff at St. Francis of Assisi Catholic School. For the generosity, efforts, time and reflection, it is our St. Francis Family that is the true blessing. St. Francis students exceeded their contribution goal for Parish Christmas Food Baskets. Our students helped provide food to over 100 needy families in Bend through the Christmas season. Fun things we are doing! Drama Club Production "The Holly Family Saves Christmas, a Sort of Musical"
Christmas Parade, 2nd Place Sweepstakes! Jan. 28 Catholic Schools Week begins with activities that focus on the theme of Learn. Serve. Lead. Succeed. 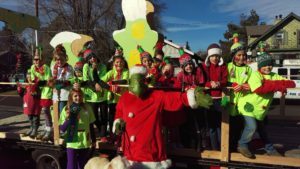 For the month of December, Parents of Saint Francis hosted 'Kids Night Out' on December 4 and entered a float representing Saint Francis School in the Bend Christmas Parade. A special thank you to Kara Smith, Myriah Buccola and Courtney Macias for coordinating these two events. The next PSF meeting is scheduled for January 10 at 6 p.m. All parents are encouraged to attend. The meeting location is to be announced. The next PSF event will be Family Fun Night on January 26. Volunteers are needed. 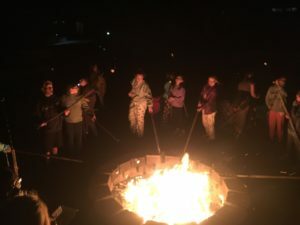 SFSCSC has been busy! The Club provided coats and socks to the FAN at Mt View High School on November 13th. THANK YOU for your generous donations. We also cooked dinner and Christmas cookies on December 8th at the Bend Ronald McDonald House. On Saturday, December 16th, club members helped deliver Christmas Baskets assembled by parish volunteers. The next Club meeting is TBD but will be in January to plan our February community service event. The Lego Robotics team just finished their competition and placed first in Core Values. Go Wolfpack! St. Francis MathCounts team is gearing up for their math competition in February! They are tackling awesome math problems in their meetings and looking forward to hosting the district competition. Chess Club is starting off strong with 12-15 players each Monday afternoon. The students listen to a short lesson and then play games focused on that lesson. Some students are beginning to prepare for a local chess tournament that will be held in February. We are proud of our St. Francis Boys Basketball Team! And huge thank you to our new cheer squad for their enthusiastic support! It is hard to believe that autumn is here and it is almost October! As we finish our first month of school, I want you to know that I am truly amazed by the dedication of our teachers, staff, parents, and students. The learning, growth and activity I witness within the halls of this school inspires me. Thank you everyone for making the beginning of this school year so special! 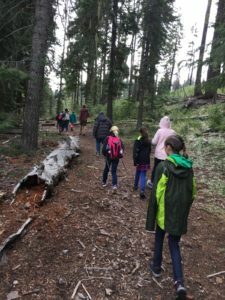 Middle School students recently returned from their overnight Harmony Confluence at the Powell Butte Retreat Center. 5th grade returned from a successful outdoor school at Camp Tamarack! 3rd and 4th grades are gearing up to head to Crater Lake for their first field trip of the year. Many of the classrooms will be heading to pumpkin patches. The students’ work in the school garden has helped us provide over 130 lbs. of produce to the St. Vincent food bank this season. The 5th and 6th grades are going to the High Desert Museum on October 11th for a great learning opportunity. 6th grade will be learning about energy and the environment by exploring renewable resources like solar and wind power in the context of global climate change. 5th grade will be learning about the effects of forest fires on Central Oregon’s ecosystems. The students will be challenged to learn why some trees thrive in fire-prone areas and how forest fires can be healthy for the ecosystem. Kindergarten is praying one decade of the Rosary each day during the month of October. We are blessed to welcome the Missionary Sisters of the Alliance of the Holy Family International to our parish from Wednesday, September 27th, to Sunday, October 1st. The Sisters will explain the important message that Our Lady of Fatima brought to the world, and how we can live that message today. 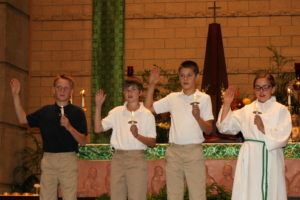 Our students participate with Mass, saying the rosary, a consecration to the Sacred and Immaculate Hearts, and the Investiture of the brown scapular. Wednesday, October 4th - Blessing of the Animals Join us with your pets for our annual St. Francis of Assisi Feast Day Blessing. Dogs are welcome, but are not allowed inside the building and must be on leashes. Wednesday, October 4th - Information Meeting for Sacraments of Reconciliation, Conf and First Eucharist for parents at if you have not met with Janet Schwartz. Wednesday, October 25th- Called to Protect Parent meeting. One parent from each new family is asked to attend. Halloween Costumes for School- Father Jose and I enjoyed seeing the children explore the lives of Saints last year for Halloween. This year we are once again asking our students to dress up as a Saint or representative of a Patron Saint for our school Halloween celebration. The classroom teachers will go over the expectation with the students and reviewing the vast list of Saints that would be acceptable for our theme. Students may be asked to present on their particular Saint or Patron Saint. 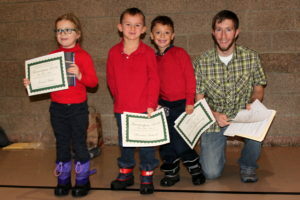 1st Grade performed a reader's theater play for parents and preschoolers! Preschool and PreK are moving and shaking to a variety of musical styles, such as marches, classical, bluegrass and pop music as well as create our own music with our classroom instruments. 4th grade is working on their “Flat Stanley” Projects. Soon they will send their projects to different states across the country and learn about the fabulous country we live in! 7th grade students are creating their own Roman inspired mosaic projects in social studies. The Middle School Yearbook class is selling ad space in the Canticle as well as Personal pages if you’d like to recognize your student personally with a photo of your choice and a nice message. Contact Courtney Macias for more info! The School Advisory Council (SAC) meets on the second Thursday of every month. The September meeting focused on reviewing the School’s new Mission and Vision Statements which were developed over the summer. The group also focused on future goals for the school and the strategic plan. SAC’s next meeting is October 12th at 5:30 in the school library. That meeting will focus on the National School Lunch Program, Wellness Program, and School Budget. If you are interested in observing the meeting please contact Jamie Griffin by October 7th. Parents of St. Francis (PSF) is the heart of our school. This group is responsible for a number of fun extra-curricular activities that raise invaluable resources for our school. September’s meeting was full of exciting energy and ideas that is sure to make this school year amazing! Please consider attending PSF’s next meeting. Volunteers to assist in the lunchroom (Monday, Wednesday, Thursday) are needed and would be greatly appreciated! Our fabulous volunteer librarian, Joan Tyler, could use help with reshelving books. This is a flexible volunteer opportunity allowing for volunteers to help whenever they have extra time. MBSEF- Mountain Biking and Community Service Club had an awesome first two weeks of the program! Trail conditions and weather lately have been optimal for riding bikes, getting dirty, and most importantly, having fun. We tend to ride on different trails every time we ride. From there, we have easy access to trails of all difficulties, where there is fun to be had whether it’s your first time on a mountain bike, or you are a seasoned rider looking to challenge your skills. When we ride, we divide our coaches and riders into small groups based on their general ability, so that the kids can ride with others that are at a similar skill level. When riding with MBSEF, one can expect to experience many different types of mountain biking. Whether you love hitting jumps, riding fast exciting downhills, or exploring the forest on longer cross-country trails with varying ups and downs, MBSEF Mountain Biking can teach you how to ride it all. The St. Francis School Community Service Club is a group of students and parents with a desire to reach beyond the walls of our school and discover how we can help others and our community. We will meet once a month to discuss and plan events. Meetings will be student-led, with an emphasis on discussing and implementing student ideas while also having fun! The first meeting is October 27th. Parents are encouraged to attend the meetings with the students. Each year, St. Francis of Assisi Catholic School honors our Patron Saint by raising money and donating food and supplies for animals. All of the donations received go directly to The Humane Society and our local Equine Outreach programs. This year, we are asking students for a $5.00 donation in exchange for a pretzel, ice cream and two free dress days (Oct 12th & 27th). Ideally, the funds will be collected in advance. Each food or supply item a student brings to donate will receive one raffle ticket entry. At the end of the drive, a ticket will be drawn and the winner receives one free dress day for their whole class. Students can also buy raffle tickets 5/$1.00 for opportunity to win free dress day for the whole class. Bring the whole family to our St. Francis Fall Harvest Party at the Imwalle Ranch for games, treats, hayrides, a haunted house and bonfire. The party will be Friday October 13th from 5:00 p.m. to 9:00 p.m. Costumes are highly encouraged! Admission is 1 can of food per person and cash donations benefiting school will be gladly accepted. Please place your donations in the boxes near the entrance. Welcome to the 2017/18 school year! We are only a few weeks away from the first day of school and all of us at St. Francis have been busy preparing for another great year. There have been changes made to the Parent/Student handbook, upgrades in the classrooms, curriculum adoptions, and teacher changes to communicate. Below, I have outlined things you should know coming into this new year. Just within the last week a group of Advisory Council members, staff, and administration began the process of Strategic Planning. We are excited to announce our new Mission and Vision. Mission: St. Francis of Assisi Catholic School provides students a Christ centered community, educating the whole child through academic excellence and instilling the virtues that will guide them to be service minded leaders. Vision: St. Francis of Assisi Catholic School inspires academic scholars motivated to serve and lead the world with Faith and moral character. Each classroom has a fully functional SMART Board. That each student beginning in kindergarten is provided a Chromebook for interactive lessons. Teachers have been equipped with laptops for professional use. 7th grade science curriculum, IQWST, has been purchased to align with the Next Generation Science Standards. The majority of our families have been with us for several years and are extremely familiar with our Parent/Student Handbook. I would encourage all of you to take the time to revisit the handbook to avoid any surprises during the school year. Please see attached handbook. We are grateful for all of Mr. Hopper’s energy and contributions to our school and are excited for his next endeavor at St. Thomas Academy. It is imperative that we continue to support our students, teachers, and families with a special education teacher and with that, we have hired Mr. Dave Wolf to take over our Special Education program here at St. Francis. Mr. Wolf has been a Special Education teacher for 8 years and specializes in helping his students develop and find personalized strategies to help them be successful in their academics. He is dedicated to positively influencing and empowering those around him in order to help them realize what they are truly capable of. St. Francis strives to maintain a strong sense of community. With that, we have listened to many requests and made the following changes to our day to day and yearly events. Drop off begins at 7:45 am, students will go directly to their classrooms. To encourage community, we ask that parents come into the school when the opportunity arises to say hello to your child’s teacher and chat in our new parent hospitality room! Students may come to school dressed out-of-uniform on their birthday or half-birthday (if their birthday falls during the summer months)! We ask that all of our middle school students attend the Ice Cream Social in order to sign up for their elective courses for Fall term (if your family is unable to attend, please email me directly in order to sign up). We look forward to a positive year and spending it with your beloved children! Mrs. Frost and I are back in the office full time and hope to see you at the Ice Cream Social, First Day of School, or Back to School Night. If you have any questions regarding this upcoming school year or would like to schedule a meeting, please feel free to email me or call /text my cell phone. "St. Francis of Assisi Catholic School provides students a Christ centered community, educating the whole child through academic excellence and instilling the virtues that will guide them to be service minded leaders." As we begin our annual observance of National Catholic Schools Week, we’d like to thank you for aiding us in our mission at St. Francis of Assisi Catholic School. Starting tonight, January 27th, with our kick off Family Fun Night, we have a whole week of activities planned to show what our students are accomplishing and to celebrate community we have built to educate tomorrow’s citizens and church leaders. This year’s National Catholic Schools Week theme centers on community: “Catholic Schools: Communities of Faith, Knowledge, and Service.” The theme highlights the fact that St. Francis of Assisi Catholic School is not only a community within itself but is part of many other communities, including your family, our parishes, Bend, Central Oregon and our country. The theme also focuses on key elements of Catholic education: faith development, academic excellence, and dedication to service. These elements set Catholic schools apart from other educational options. They are why families make sacrifices to provide their children with a Catholic education. In the spirit of National Catholic Schools Week, we will be opening our 2017/18 school year registration for our current students and siblings. As a reminder, in order to show your commitment to St. Francis of Assisi School, you will need to register online through your family Sycamore account. Open registration for new families will begin on February 10, 2017, do not loose your child’s spot. Please utilize the “Refer a Friend” form to get tuition discounts, increase our enrollment, and share the good word of St. Francis of Assisi Catholic School! I am grateful every day for the teachers, staff, Advisory Council Members, Parents for St. Francis (PSF), parents and volunteers who make our school a success. National Catholic Schools Week is a good time for all of us to thank them for their dedication and service. "St. Francis fosters a lifetime of learning with an expectation of excellence"
The Christmas Season is a perfect time to reflect on our blessings. How blessed we are to have such caring, passionate community of students, families, and staff at St. Francis of Assisi. For the generosity, efforts, time and reflection, it is our St. Francis Family that is the true blessing. Some of the blessings that St. Francis has brought to our community are listed below as well as some other important news! 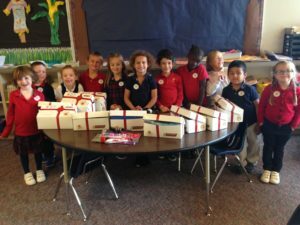 In the past weeks, St. Francis of Assisi students participated in the Box of Joy program, a Christmas gift campaign organized by Catholic schools, parishes and groups nationwide. By packing Boxes of Joy with toys and other gifts, our students blessed children suffering from extreme poverty by sharing the joy of Christmas and planting seeds of hope through the Gospel. This year we blessed 55 impoverished children in the Dominican Republic, Haiti, and Guatemala. Closer to home, St. Francis students helped to fill Parish Christmas Basket collections which provide food to over 100 needy families through the Christmas season. This year we put on an Empty Bowls Event, which for a first-year reintroduction was very successful! We brought in $200 for St. Vincent De Paul and we fed 15 guests. Our garden has produced 406 pounds of produce that were donated to the St. Vincent De Paul Food Bank. Several of our classes have made visits to Stone Lodge and have written cards to the sick. In November, in celebration of St. Francis, we were able to donate about 1,500 pounds, of pet food to the Central Oregon Humane Society and $700 in cash to three local equine rescues. The community is blessed with the gift of stewardship that our St. Francis demonstrates. A huge thank you to our beloved Courtney Macias for organizing, creating great costumes, and rallying our families for a great time with donuts and hot cider at the Bend Christmas Parade. Thank you to Matt Cohen for driving the float and the use of his truck, trailer, and handcrafted chimney! It was because the of 43 enthusiastic students dressed as "Whoville" citizens that we won the Mayor’s Award, best entry by a youth group? Did you hear there was even a Grinch on site? You’ll have to guess ‘Who’ it was! Kids Night Out was a big hit for both the kids and the parents too. We had 39 kids come out for pizza and a movie in their Christmas PJs. We also enjoyed Christmas crafts and a little dance off too. PSF raised over $300 at the event. A few items were left behind and have been placed on the lost and found table. Father Jose decided after meeting with our staff and selected Advisory Council members that he wanted to secure a principal for several years to provide stability to the school and parish. I feel grateful that Father offered me a multiple year contract, which I accepted, with the vision of on-going stability in the administration and revitalization of the school back to a full blown pre-K thru 8th-grade educational institution. I am truly thankful for all of the support and encouragement the staff, parents, and community have given me at St. Francis over the last year and a half and will to continue my efforts in making St. Francis the most sought after private school in all of Central Oregon. We have hired a new Spanish teacher, Ana Torres. She is currently working towards her degree in education and is very involved in the Spanish Ministries and Religious Education Department. She came highly recommended by Daniel Gutierrez and Father Jose. I truly believe she will be a great addition to our team! 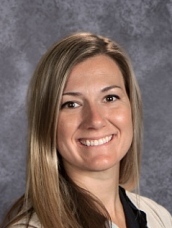 Due to medical reasons our Spanish teacher, Fatima Lopez, had to resign immediately on December 5th. Starting January 4th, St. Francis of Assisi will be offering band to our 4-6th grade on Monday and Wednesday mornings from 7-8am. The initial class will require parents to attend the first 15 minutes of class for a parent informational session. With over 40 years of performance and teaching experience, Rich Hurdle has taught students of all ages and skill levels with an education in music theory, musicianship, aural skills, improvisation, composition, arranging, stagemanship, and technical training in all genres of music. Mr. Hurdle is very excited to bring band to St. Francis! Please email me directly if your child will be signing up for Band by December 30th! As many of you know, tuition covers approximately 65% of the cost to educate a student at St. Francis. The remaining operating expenditures are met through our two major fundraising efforts, Annual Giving Appeal, and The Auction. AGA typically runs from August through November. We send out requests to previous donors, stakeholders, and families asking for generous contributions to assist in the financial security of the school. This year we are at 50% of our budget goal of $55,000. Being that we did not make our budgeted projections for AGA, it is going to need to be an all hands on deck situation for the Auction. Our Auction Chairs, Carrie Cohen and Ann Fleck, have made it so grandparents to family friends on the East Coast or wherever they reside can participate and make donations to our Auction. Our goal is to have 200 attendees with the majority of them ready to raise their paddles! As always, if you ever need to reach me or meet with me, my schedule is on Sycamore and I will always find time to meet with a parent. As we joyfully prepare for Christmas and the coming of Christ, on behalf of the faculty of St. Francis, we wish you all of God’s blessings during this holiday season and pray for all of our students’ safe return to school on Tuesday, January 3, 2017. 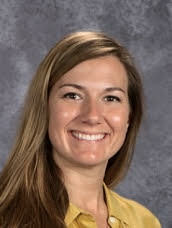 5th graders at St. Francis School scored at an 8th grade equivalent in Math and 7th grade equivalent in Reading on a nationally normed assessment. Our 8th graders scored at a 12th grade equivalent in Math and a 10th grade equivalent in reading on the nationally normed assessment. St. Francis’s 5th grade students ranked in the 82nd percentile in math and the 68th percentile in reading! St. Francis’s 8th grade students ranked in the 72th percentile in math and the 64th percentile in reading! 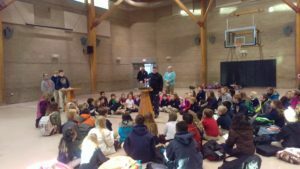 St. Francis of Assisi completed the renewal of its Accreditation and is one of two Nationally Accredited Middle Schools and one of five Nationally Accredited Elementary Schools in Central Oregon. In addition, we are one of seven Stewardship Schools for Oregon State University’s Oregon Natural Resource Education Program as apart of our STREAM Program. 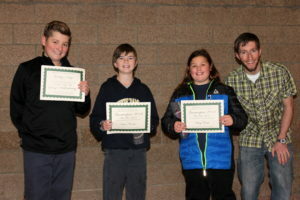 This year St. Francis of Assisi had twenty-two Bend Research Inventerprise winners! Seven of our 5th through 8th students participated in the COCC Regional Science Fair and six of those students won awards! The 5th grade Oregon Battle of the Books team competed at the District level. There were ten Catholic Daughter Education Contest Winners ranging from 5th to 8th grade, four of those contestants went on to State. Our 5th grade Robotics team brought home the first place trophy for District level competition. Blessings to the 6 Sacramental Confirmation and to the eleven students who received their First Holy Communion and Reconciliation. Congratulations to all of our talented student athletes on their performances. All thirty-eight of the track team participated and placed in Districts. The 6th grade girls track team brought home the First Place trophy. There were several personal and season bests achieved at the meet, including a record breaking finish in the 1500m by Michaela Lorenz with a time of 5:33.68. Our Cross Country team had a very successful season with seven student athletes qualifying for districts with three overall ranked! Our Auction brought in twenty-two percent more than we projected in our annual budget which ended with a net income of $115,000. The Business Partnership Program has three Gold Members and three Frankincense Members! With your support we went from having a projected loss of $58,000 to being in the black by more than $5,000. I would like to thank each and everyone of you who has assisted in the fundraising efforts and your commitment the evangelization efforts of St. Francis of Assisi Catholic School. I am excited to announce our staffing for the 2016/17 school year for St. Francis School. St. Francis School is important part of the St. Francis Parish and as such the Parish and School Advisory Council want to demonstrate their commitment to our Catholic Faith and the education of our students by committing additional funding for staffing for next school year. With this commitment and the generosity of the Foundation and the great support of Bishop Carey this staffing plan is possible. For 2016/17 school year there will be no blends in our elementary and we will be bringing several part time positions back to full time. We will also be offering full time preschool for the three and four-year-old students. We are going to make a strong effort to rebuild our middle school into the thriving education program it has been in the past. The Bishop and the Foundation are in full support of a rebirth of our Middle School. Our 7th and 8th grade classes will be blended in ELA, Social Studies, Science, and other electives. We will separate 7th and 8th grade for mathematics. 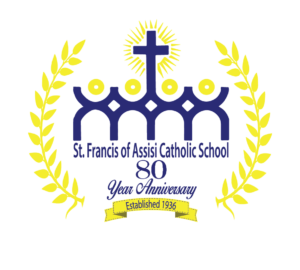 We feel confident that through recruitment/marketing efforts and our increased commitment to our staff and students, that St. Francis of Assisi Middle School will once again thrive. We appreciate your on-going support and hope you will join us in growing our entire school for next year and in the future. I look forward to a wonderful 2016/17 school year. And again, thank you for your continued support!